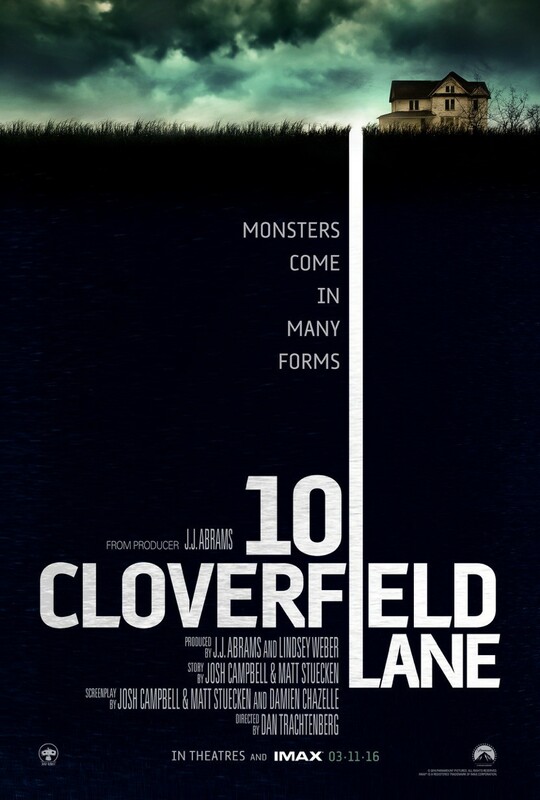 I feel deeply conflicted after walking out of 10 Cloverfield Lane largely due to the fact it doesn't seem to need the word "Cloverfield" in the title. The fact this "distant relative" of a sequel to the 2008 monster movie came out of circumstances that didn't necessarily create it for the purposes of being what it has become becomes a bigger deal the further one gets into the experience of watching the film and the further it gets away from being anything having to do with Cloverfield. If anything, this film is more of a pseudo sequel if you're a fan of the original and go in hoping for more of the same. Rather, gone is the handheld technique that defined the first film and gone are the monsters (for the most part) that made the film and that handheld technique so noteworthy. Instead, what we are given here is a different type of monster movie; one that excels and propels itself forward based solely on the character interactions and lack of awareness from the circumstances in which these characters come. It is the peeling back of these layers that not only reveal to the audience who each of the three main characters might be, but also the revealing of each's true agenda to one another that makes the proceedings completely enrapturing. 10 Cloverfield Lane sustains such momentum for much of its 100-minute running time due to the fact it is a generally great piece of tension-filled filmmaking that elicits grand gestures of horror and the types of thoughts that come with finding one's self in such situations as typically presented in the thriller/horror genre. It is in the last act, the last fifteen minutes or so that the film stumbles in attempting to connect the dots and make this little film about three separate individuals more than it needed to be. Maybe I'm simply not satisfied by the answers the film chooses to provide for all of the mysteries that were laid out from the get-go and yet the answers provided in the more contained spaces of the film felt satisfactory whereas when the film attempted to expand its horizons things didn't feel as natural as they should. There was certainly a better way to create reason for having the word "Cloverfield" in the title, but it is this inorganic last act that knocks 10 Cloverfield Lane down from something great to a cog in the franchise machine, if not a shiny cog at the very least. Michelle (Mary Elizabeth Winstead) finds herself trapped in a bunker with no memory of how she came to be there. Directed by first time feature director Dan Trachtenberg the film begins with a somewhat surprising shot given the type of consistency we get in franchise films these days. I took away from the first film that it happened in a 2008 reality so when this new film opens in a bright and bustling 2016 I immediately wondered where this would be taking place geographically and how might this make sense in the grander scheme of things if everyone had recovered and rebuilt from the initial attacks eight years earlier. We learn rather quickly that the environment we've entered is in the southern region of the U.S. and that the film really has no regard or any desire to acknowledge any past events of any sort, much less Matt Reeves 2008 film and thus the event that forces Howard (John Goodman), Emmett (John Gallagher Jr.), and Michelle (Mary Elizabeth Winstead) together in this doomsday bunker may or may not have anything to do with the monsters that invaded New York. The beauty of the film though is that whether the justification for these three individuals being forced into this situation is connected or not it really doesn't matter by the time we become entrenched in the situation at hand because all we come to care about are the true intentions of our core trio. 10 Cloverfield Lane is a claustrophobic film, one that gets in so close with not only its individuals, but its setting and thus hones our attention in on one specific aspect or detail to the point that when something disrupts such focus it genuinely shakes us. Yes, 10 Cloverfield Lane might technically be classified as some type of mystery/horror film, but it never uses these guidelines to sink to jump scare tactics or mystery for mystery's sake. There are substantial answers to be found and ones that make sense within the reasoning and tone of the film and there are certainly times where my body physically reacted to the material, jolting me to the edge of my seat. All of this, accompanied by the terrific soundtrack from Bear McCreary and cinematography from Jeff Cutter (Orphan, 2010's Nightmare on Elm Street) that's clearly inspired by the eighties golden age of horror makes for a complete package whose quality is only heightened by Trachtenberg's clear craft and the actors flawless performances. While both Winstead and Gallagher Jr. do fine work here, in fact they both do some rather exceptional stuff with their looks and sideways glances given the subtlety they must apply in the given situation, it is Goodman that comes away leaving the biggest impression. As Howard, the veteran actor turns in yet another what is sure to be under appreciated performance. Reminding audiences of just how versatile a persona he can not only create, but fully embrace Goodman indisputably steals this show. We see Goodman in so many films that it's easy to take him for granted, but if one looks at his filmography it's easy to realize many of his films stand out not just for their title or cultural relevance, but because of what Goodman brought to that film-a lot of the time his role being more memorable than the movie itself. With 10 Cloverfield Lane, Goodman is given the chance to do something he doesn't often get and that is to play the lead. While we are delivered the story from the perspective of Michelle it is Howard who is clearly in charge and the one who will guide most of the action that will inevitably take place in this tight environment. Without going into too much about the particulars of the plot or specific character traits we meet Howard only after Michelle wakes up from having been in a car accident and is now chained to a pipe in a room akin to a prison cell. We come to learn that Howard apparently rescued Michelle from the aftermath of her wreck and brought her down into his bunker to save her life. Given the odd position this puts both characters in coupled by the fact we don't know who to trust given we know little to nothing about either of them both Trachtenberg and the script from Josh Campbell, Matthew Stuecken, and Damien Chazelle use this set-up to test our allegiances while inherently attempting to sway them towards Michelle's side. Goodman brings a sense of hostility to Howard that puts everyone on edge, but the beauty of the performance is that it's impossible to tell if this hostility is due to the characters insecurities about trusting these strangers just as they are him or if it's something more? Something a little crazier? It's interesting, for despite the fact Howard clearly loathes Emmett there is a kindness of sorts to the way he treats Michelle that makes one want to trust and believe that he's not a complete psycho. Emmett (John Gallagher Jr.) challenges Howard (John Goodman) as Michelle looks on in fear. I understand the benefits of the film being labeled with the Cloverfield title given many more people will likely now see this expertly crafted thriller due to its supposed connection to a hit film than if it were just another small scale March release with an impressive cast. Being able to ride the wave of being another in the canon of J.J. Abrams produced "mystery box" movies will undoubtedly prove to be beneficial not only for the films box office returns, but for the rookie talent behind the camera as well. In the larger sense of how today's movie industry works this plan completely makes sense, but my point is that the film doesn't need the attachment to an already established franchise to be an interesting movie. In fact, it is this strained connection that detracts from what might have been a more satisfying conclusion were it not trying to fulfill a kind of unnecessary need. Regardless of the context from which the idea came to make this film a successor to Cloverfield though, this is still very much a film I really enjoyed and borderline loved. The pacing is damn near perfect with the first forty-five minutes or so defining each of the characters and dolling out details around the reasoning each have come to be in the bunker. The set decoration of the bunker is especially spectacular with the countless food stocked and variations on how Howard has chosen to contain it, the plant life in small, discreet spots throughout and even down to the pillows on the small couches in the living room-it's all expertly done to accentuate the necessary tone of a forced fantasy. As the final hour of the film begins the necessary turns and reveals are made to keep the narrative moving forward without ever feeling like the film is purposefully holding out because it's not sure what to do with itself. Rather, the film and specifically the character of Michelle push the story forward forcing both Emmett and especially Howard to come to terms with the type of people they are. Through these moments of insight there comes to be a theme of regret in our protagonist that proves her to not only be the necessary amount of resourceful, but also to give her the emotional confidence to go through with what she has to do. I have to wonder if Trachtenberg will one day regret making his rather stellar debut part of the ongoing machine that might better be remembered more for its place in Abrams filmography of surprises rather than for the solid content it actually provides, but given the opportunities he will likely gain for doing so I doubt regret will be in the cards. And with that, 10 Cloverfield Lane is a gold medal-level film that ultimately is only able to win the bronze.